Change Management at its Best! Windows VisualSVN Server, version 2.6.0. Please note: Earlier versions may still work, but have not been tested. 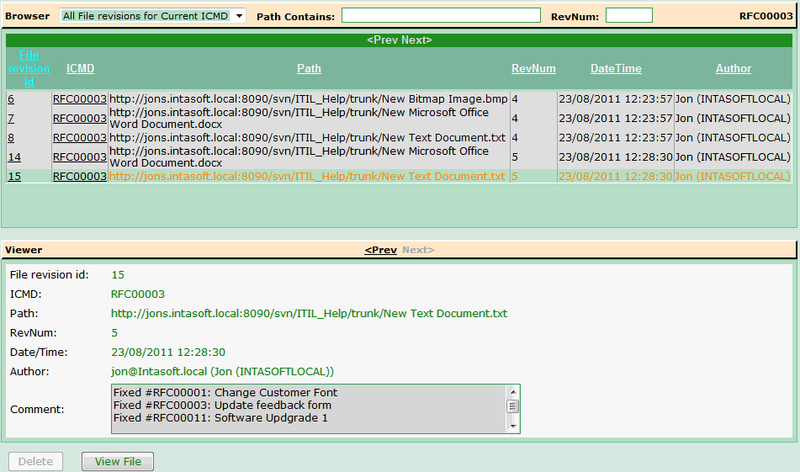 IntaChange Enterprise introduced a new “File Revisions” Feature enabling you to associate multiple versions of your files with the Change records you create in IntaChange and of course, vice versa. (a) Against the Subversion file version(s) which changes were selected. (c) Optionally, progresses the IntaChange Enterprise change record to the next status in their life cycle/workflow. 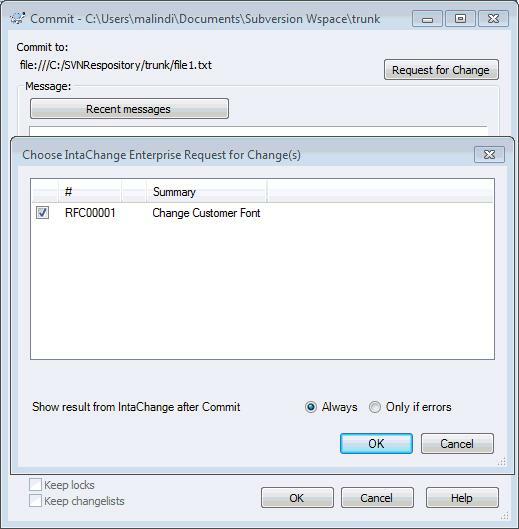 When a user views a change record in IntaChange Enterprise, IntaChange can access Subversion to fetch the actual file content of the version(s) committed/changed against that change record to enable you to see precisely what edits were performed. Similarly, when a user views a version in Subversion he can see which IntaChange Enterprise change records were associated against it, and is able to simply click on it to access the change record. This does not mean that your files are stored in yet another area or database. The entries on the File Revisions Page are actually just “references” to the physical file contents so end users do not actually add/update/delete any items that you can see on the page opposite. These are created and manipulated by the file revisions provider ‘Subversion’ (“SVN”). Although the examples you can see on this page are based on the ITIL® Project out-of-the-box configuration (which is why they are labeled as “RFC’s”, the Integration is available using any template or configuration you wish to use/create. Note: If you cannot see the File Revisions feature of IntaChange Enterprise your administrator may have disabled the feature in which case the File Revisions browser/viewer will not be available.